One more set of spring garden photos. 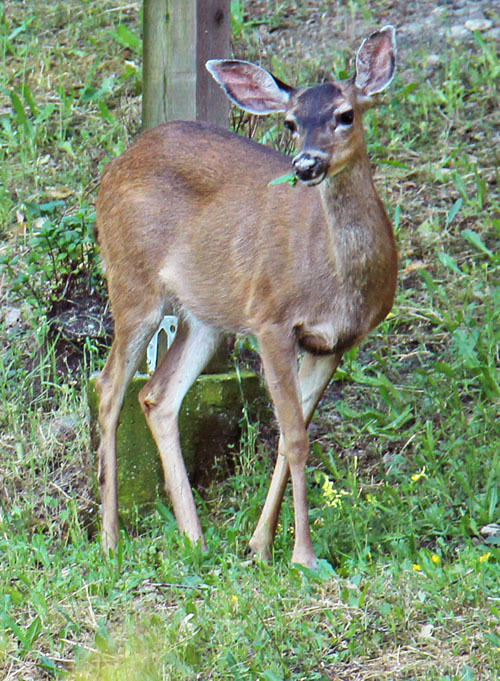 🙂 While I was outside yesterday, a deer was munching on grass around the foundation of the main house. 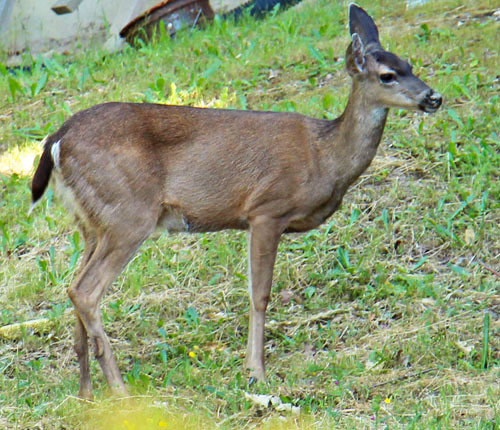 She was about 40 feet away from me, but I got a few pictures with the telephoto lens. She put her head up to look at me periodically but wasn’t too concerned that I was watching and clicking pictures. Those big ears are cute. I also took a few quick pics in the garden. 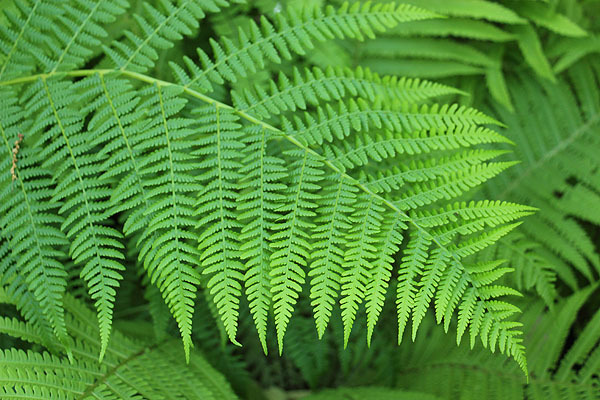 Here are fresh green ostrich fern fronds that emerge each spring in the back planter box under the shade of the oaks. I love the extra bright green at their tips. These are behind the deer fence or else they would likely be eaten. 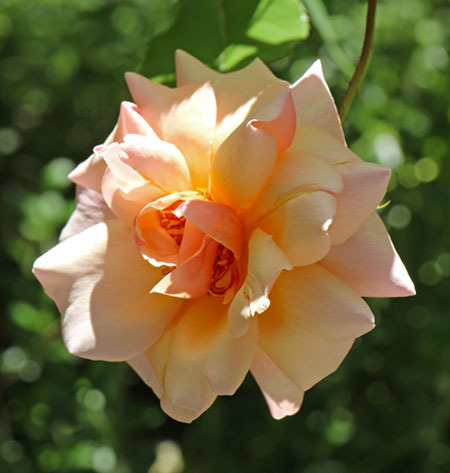 And here is a rare old rose, Gruss an Coburg, with the most delicious fragrance. It has a pretty peachy color and an unusual flower form. 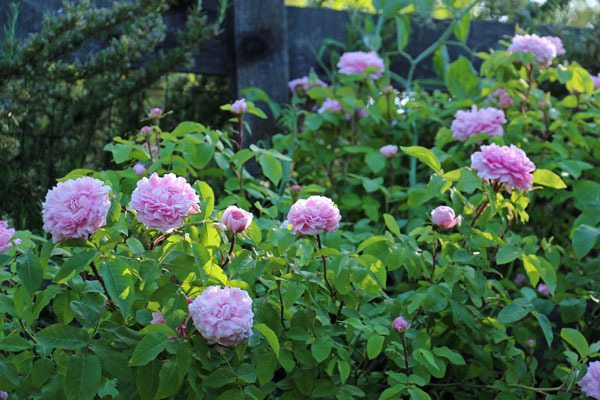 The bush itself gets a bit lanky but is worth growing because it repeats bloom all summer and has an incredible scent. It’s not a long-lasting cut flower though (I get a day or two from them). I posted a picture of Climbing Pinkie rose last year, but here she is again this spring. The bloom should get heavier later this week with warm weather predicted. The formula for the new Spiced Citrus Vetiver is done and I’m batching it. I ran out of one bergamot but will get more Tuesday. I expect to have samples up soon and bottles by the end of the week. I really like how it turned out! I took a few more garden pictures today. 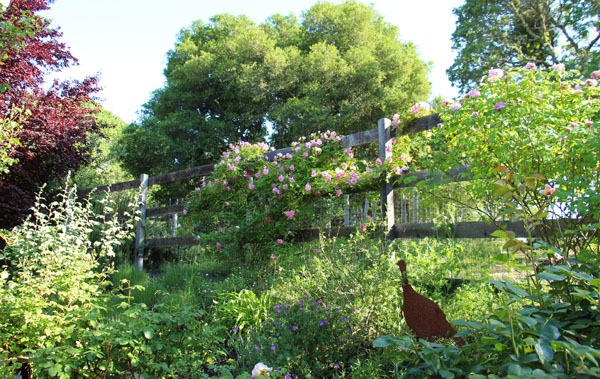 This one looks up the hill to the deer fence with several roses on it. Some oak trees are in the background, and you can see a bit of the plum tree on the left. The turkey is some garden art given to me as a gift (two metal wild turkeys that look like the real ones that live around here). The upper bed has a lot of weeds that need plucking; it’s time to call one of my garden helpers for a visit. Here’s an old rose called Jacques Cartier. 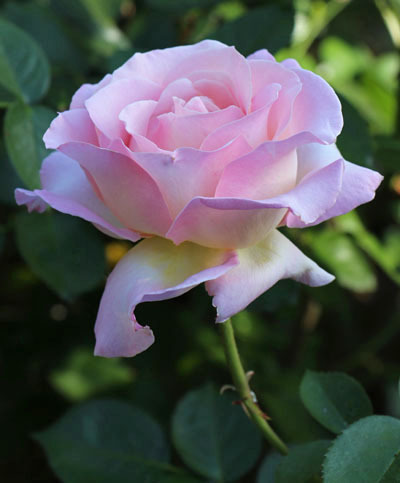 It has a wonderful soft fragrance. And just a single rose in a pretty stage of opening. With spring in the air here in the USA, Victoria included Voile de Violette in her Top Spring 2013 Picks on the EauMG blog. And with fall imminent in New Zealand, Kelly posted a wonderful review of Ambre Noir on The Blackthorn Orphans. Thanks, both of you! 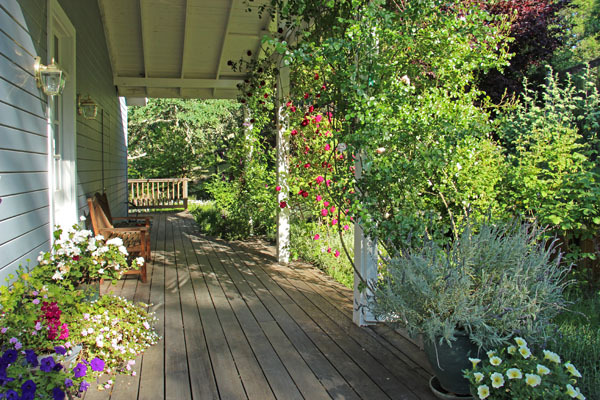 Sitting on the front porch right now is delicious with the air scented by roses and pink jasmine. 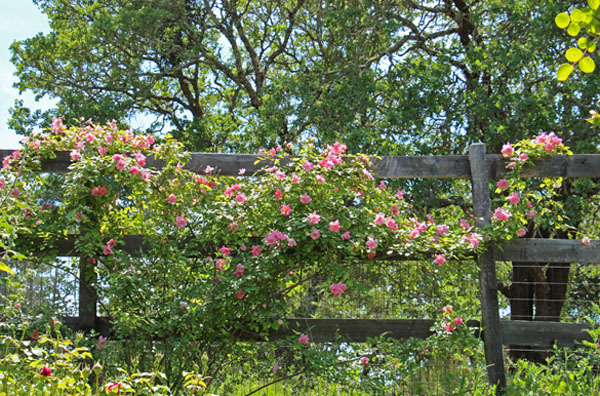 The jasmine scent travels literally 20 feet from the vine, but it is on the fence farther away and mingles perfectly with the fragrance from the roses that grow up the porch posts closer in. 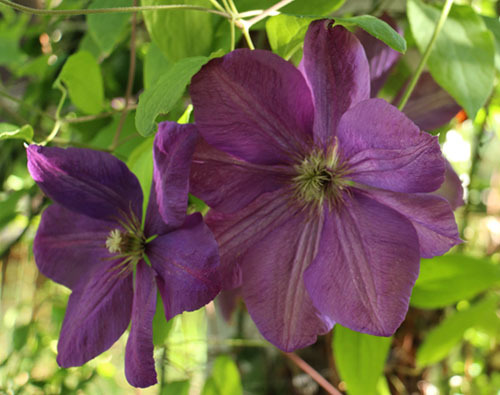 Clematis and perennials are starting to bloom too. The little lizards are back basking in the sun — I had to herd one out of the house yesterday with the dust mop (yes, that looked as silly as you imagine). Just picked the first sweet pea bouquet, and just ate the first home grown strawberry of the season! My interview on Olfactif has just been posted. Tara Swords, the woman behind Olfactif, does a very nice job with these perfumer interviews. She is an experienced author/journalist and it shows. The blog Sense of Scent recently posted an interesting interview with Tara. She explains her goals with the new Olfactif sample service, her target audience, how she defines niche, and how she chooses scents for each month’s theme. Josh Meyer of Imaginary Authors was interviewed last week on the Olfactif site in Part 1 and Part 2. It was fun to get to know more about him and to learn how he got started in perfumery. And one last Olfactif related link: the EauMG blog is offering a drawing for a free 3-month subscription to Olfactif. You have until April 13th to enter. I received a lot of orders this weekend with many bottles to fill and package (everyone seemed to pick this last Fri/Sat to order), so I didn’t get back to the new vetiver scent until last night. Spiced Citrus Vetiver is my top priority right now and I’ll try to finish asap. Thank you, Natalie, for your reviews of Nostalgie, Jour Ensoleillé, and Cocoa Sandalwood on Another Perfume Blog! Your analogy made me smile because sometimes it does feel like the little engine that could around here, lol, just trying to slowly and consistently make progress up the mountain. We probably all feel that way though, making gradual progress in various areas of our lives. A new sample service for niche/artisan fragrance is debuting this month, and the site’s product pages are going live today. It is called Olfactif. Each month they will mail three samples to subscribers, and Fig Tree is in this month’s debut box. The other two scents for this month are L’Artisan’s Voleur de Roses and Imaginary Authors The Soft Lawn. Olfactif will be including a mix of niche and artisan scents and wanted this month to have a spring theme. I’ve been contacted by sample services before and have had to say no because their terms were not workable for small artisan perfumers. As a result, that type of service tends to attract the bigger companies but miss the smaller artisan brands that cannot afford to donate large amounts of samples for free. Olfactif was the first service to approach me with a program that made it possible for small brands to afford to participate. Olfactif plans to distribute samples of niche and artisan brands to people who want to venture beyond department store scents but are unfamiliar with niche and need help exploring the options. The team at Olfactif seems sincere in their goals and I wanted to support their project. I hope they can achieve their dream of spreading the word about niche and artisan fragrance to a wider audience. If you know someone who is curious about niche perfumes but doesn’t have time to dig into blogs to figure out what to try, this service might be of interest to them. The cost of the month’s sample box can be applied to a bottle if they like a sample enough to buy a full size. I don’t know which brands are coming next, but they had a great list of brands on their consideration list. I’ve not seen the sample presentation yet but have heard it is elegant. Each month will feature interviews with the perfumers in that month’s box. You can read the interviews on the site if you’re interested (I’ll post a link to this month’s interviews when I have it).